Home News AP News After Mamata, It Will Be Naidu vs Modi! After Mamata, It Will Be Naidu vs Modi! 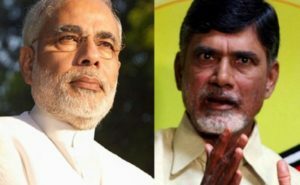 After a pitched battle with Trinamul Congress chief and West Bengal chief minister Mamata Banerjee in Kolkata, Prime Minister Narendra Modi has turned his attention on Telugu Desam Party president and Andhra Pradesh chief minister N Chandrababu Naidu. Modi will address a public meeting at Guntur on February 10. This will be the Prime Ministers first visit to Andhra Pradesh in close to two years and also after the TDP pulled out of the NDA. Modi will visit the state again on February 16 to address another rally in the port city Visakhapatnam. Needless to say, Modi will take Naidu to task during his visit to AP and expose Naidu’s bluff on his allegations that the Centre had done nothing for the state. While explaining what the Centre has done in the last four years, Modi will definitely talk about Naidu’s corruption. The TDP president has chosen February 11, a day after Modi’s rally in Guntur, to launch a counter-attack on Modi. He will be sitting on a day-long deeksha in New Delhi, where he will question Modi’s indifferent attitude towards Andhra Pradesh, his witch-hunting of the TDP leaders and his collusion with the TDP’s political rivals. So, the battle lines are drawn. While the BJP does not have much stakes in AP, but Modi’s only objective is to see that Naidu is defeated in the elections. On the other hand, Naidu wants to gain maximum political mileage by blaming it on Modi for lack of implementation of his poll promises.